This Arthur Court Aluminium Tableware is for those who like the subtleties of classy tableware. The design is unique and chic. The intricate details on the sides of the shells make this piece striking. The undulating surface on the rest of the body of the tray brings the utility balance. The shell bottle opener is a beauty. It is just the right thing to carry in your bag if you want to flaunt your style at every outdoor party you go to. The trout and shark bottle openers are good choices too if you want something that’ll take lesser space. We also have to mention the Marlin, Seahorse, and the Turtle bottle openers. 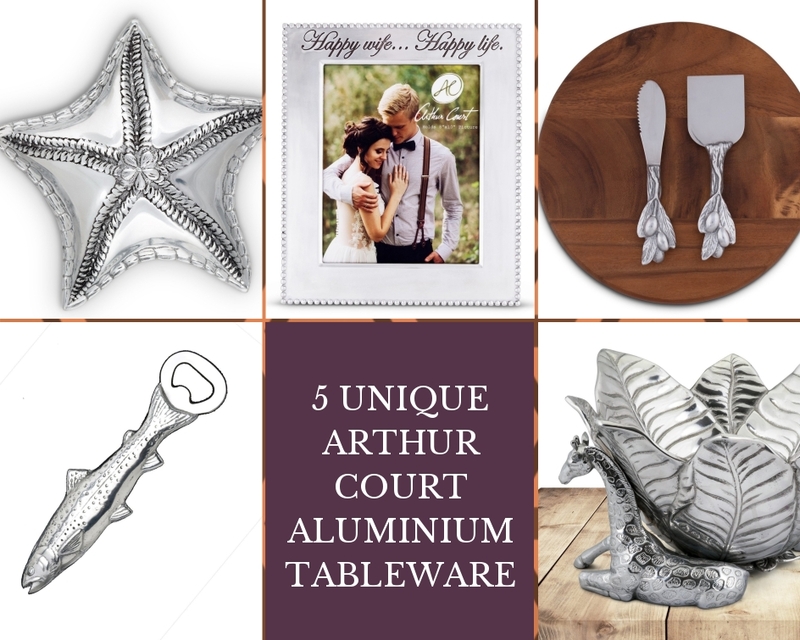 Arthur Court Aluminium Tableware is where a bottle opener collector can go crazy at. Serving trays, pitchers, and bowls that can have the name of your loved ones or your family name engraved anywhere on or inside of them are perfect for family holiday dinners. Arthur Court’s Engravable collection also includes engravable photo frames that you can place on a shelf near the dinner table. The Giraffe and Elephant pitchers are both cute and elegant. They are also easy to pour from. If you love animal designs, we can guarantee you will not be able to pick only one thing from the collection. If you want to create an entirely identical set of tableware, the Olive Collection has every piece you need. We won’t single out one item from the collection. Take a look and you will fall in love. The entire collection of Arthur Court Aluminium Tableware is beautiful. You will want to come back to Hudson-Poole Fine Jewelry to add more Arthur Court tableware to your collection. Every time you come back, you will return with more things than you intended to buy.